The original and only Invisible disc. Provides strong adhesion to glazed and unglazed surfaces. 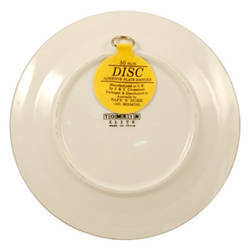 The disc is easily removed without damage to product. Comes with easy and failsafe instructions. For heavier objects, just apply 2 invisible plate hanger discs and thread wire between them, then hang the wire on the hook! Hook shown is NOT included!